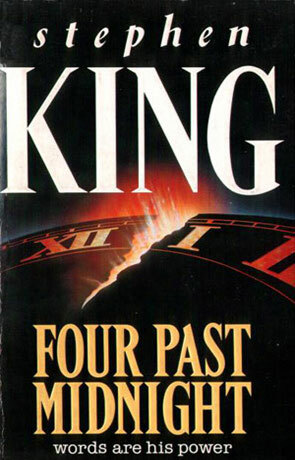 Four Past Midnight is a collection of four short stories by the master of horror, Stephen King. I guess that four stories in just under a thousand pages, means that each of the stories deserves their own review and that's just what you are going to get. Before I get to the stories, I'll just make a comment on the seven page introduction. Normally I love introductions in books, but this one was kind of disappointing, it seemed so naive and apologetic, almost as if Stephen King didn't believe in the worth of the stories in the book. Oh, yeah and the baseball bit, didn't really mean anything to me, but that's not King fault. I saw the miniseries not so long ago, which puts me in a strange situation – normally I'll go to any lengths not to see a movie if I know that there's a chance that I may be reading the story behind it some day. I like to make my own mental pictures of what the characters etc. look like. An aeroplane goes through "something" and everybody, except for the ten passengers who where asleep, disappears. Luckily the autopilot was on and even more extremely luckily one of the sleeping passengers is a pilot. Therefore, our passengers are trying to get back to the normal world, but time is literally running out. Quite a good idea, but King nearly manages to kill it between the internal struggling between the passengers and the unbelievability of the characters. Remove the blind girl and the raving lunatic businessman plot and cut the story to a hundred pages and you will have a nice short story. Ah, Stephen King writing about a writer, now we are back in charted territories. I guess that the reason I usually like these stories is that King is writing about something that he know and something that is important to him and that usually shine through in the stories. One day a man who calls himself John Shooter comes up to Morton Rainey and accuses him of having stolen one of his stories, Rainey knows that this is wrong and promises to produce evidence, but Shooter is not the kind of man who takes no for an answer. The story starts of kind of cheesy, but soon it becomes quite strong. My favourite among these four stories. If Secret Window, Secret Garden started of a bit cheesy, I'm not sure what to call the first third of this one. A cheese factory? It gets better, but no matter how strong or well written it would possibly be, the first third of the story will always drag it down – the horror can't really work when you find the premises for the story to silly. It may work for you, but it didn't work for me. If the premises for The Library Policeman were silly, the premises for The Sun Dog are downright stupid. However, to a Constant Reader the story is actually quite interesting as it tells a story of Castle Rock somewhere between The Dark Half and Needful Things. A young boy get a Polaroid camera, but something is wrong with it – no matter what you point it at, it gives you a picture of a dog in front of a white fence. As if that wasn't enough, there's something wrong with the dog, something terrible, horrible wrong with that dog! As you may have gathered I'm kind of disappointed with this book, it has its good moments, but they can't really make up for the bad moments. If you are a King fan, pick it up if you find a cheap used copy and try not to read Longoliers and The Library Policeman, unless you have absolutely nothing else to read and read The Sun Dog only for the insights it can give on Castle Rock. Written on 28th November 1999 by TC.